It may just be an experience that is unique to me but I often find with books, comics, records, etc. it is often those works which seem most simple at the start, but that gradually weave a complexity which are the most rewarding. Take Pet Sounds by The Beach Boys for example. It is immediately accessible and appears simple, there is one melody to God Only Knows which we can hum along to almost immediately. Operating beneath that surface though are the harmonies, the detail of the instruments, the shifting rhythms, etc. 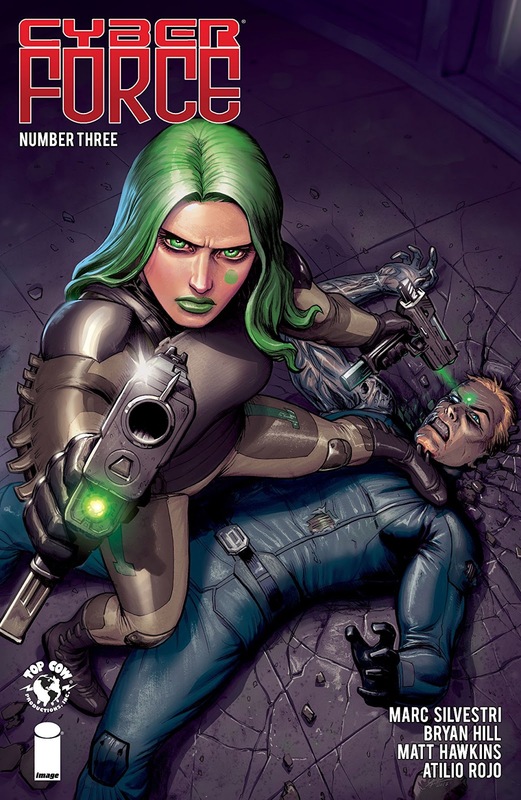 The first issue of Cyber Force was enjoyable and seemed to me like a colorful, action-packed light read. By the end of this issue, I was looking at the mechanics behind the story and thinking, "this is going to be a very, very good story". Let's find out why. Before that though, let's pay homage to the wonderful art in this book. There are no colors credit in the title page, and the art detail in its entirety is ascribed to Mr. Atilio Rojo. I make special note of this because not only is the pencil and inking work fabulous, but the colors sing off the page in this issue. From the very first page with its honey glow of yellows, oranges, and reds of sunset, to the vibrant green hair on Aphrodite (a character who will soon be getting her own book again) to the piercing color given to each character's eyes. The skin colors are wonderful, in fact, I could wax lyrical about this art all day. That would mean, however, that I would leave no room to mention the writing duties. 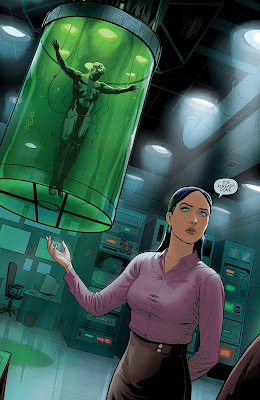 I have to say that in advance of his taking up position on Detective Comics, my excitement levels are very high for Bryan Hill, and I have great enthusiasm for all the good work being done by the Hill Administration (a little Twitter joke). I first came across his work on Postal but I have to say that this book, which is co-penned by Hill and Matt Hawkins is also fantastic. The complex themes of artificial intellect, animated lifeforms, memories, time travel, and trauma are all drawn out so well in this issue. We also get the links established to track back with the main story that we left in issue 2 and to build on the combined story next issue. This book has cast its spell on me and I am hungry for it each month. I mean, at this point I have to say this is as good as any book out there at the moment. It is the finest art I have seen in some time, and the writing is as good as it gets. I should add that people may be put off by this series thinking that they need to read the previous volumes from some years ago. I have to say that whilst a knowledge of those books may enhance the reading experience, the experience is not diminished by not having read them. Personally speaking, I have bought the previous volumes and am waiting to read them, but I'm enjoying this series so much that I can assure you there is no obstacle to reading. We are only on the third issue, so it is not too late to pick up the previous two issues and jump on board for a very good series. Good times.